Okay so first let me say...I can't believe I did a Ted Talk. Around 19 years old I wanted to change my life around because I was leading a negative one. I'd watch Ted Talks and a lot of Tony Robbins and Will Smith speeches/interviews to give myself a different outlook on life. 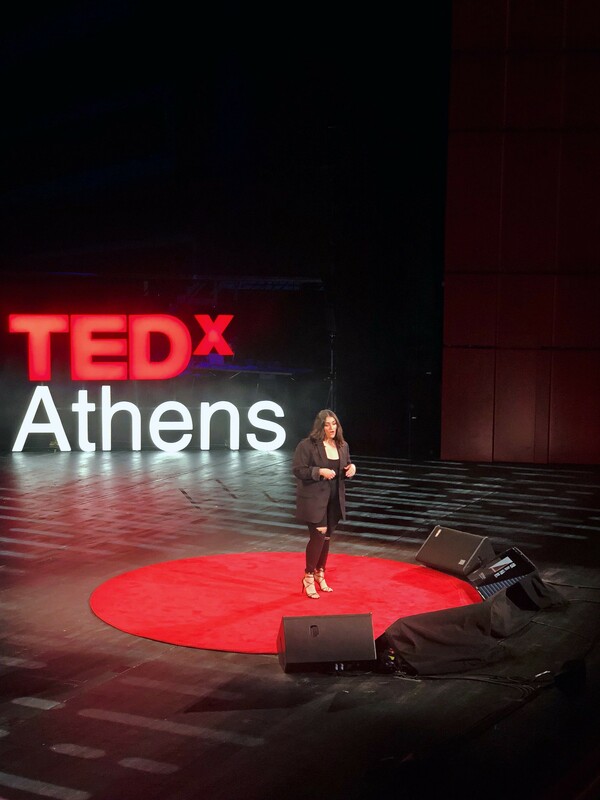 At the beginning of this year when TedxAthens reached out to me to speak on stage at their event, I teared up because I couldn't believe I'd now be up on a Tedx stage telling my story when my story included Tedx being such a inspiration to me when I was younger. I was all over the place with what I wanted to talk about. We did a few Skype calls and all was good to go. I got to Greece and did my first in person rehearsal on stage the day before the event. When I finished my rehearsal, the coaches asked me to change it. I had a powerpoint, I was prepped, all of that. I sat down with one of their coaches who literally was like "just tell your story you don't need anything else (including a powerpoint)." I was SO nervous because what I had been practicing for weeks was going to change less than 24 hours before me getting on stage in front of a full audience in a packed Opera house. I was shook. I was literally sick. When I got back to my hotel that night I tried rehearsing and was freaking out to my best friend life "I'll never get another Ted Talk". I had so much anxiety that I couldn't eat and I was literally throwing up just because I was so nervous it was changed and I didn't want to mess it up. The next day came. I went in hair and make up, then it was time for me to get my mic on. The coach was backstage telling me to stand up, take a deep breath, do the Superman pose so you can get some airflow because I was literally feeling like I couldn't breathe. I wasn't talking much so I'm sure she knew I was scared AF. Now I will say, I can do interviews no problem because you're talking back and forth with someone who is asking you questions. I can do a panel, I've done many before where I'm on stage giving advice to people in the audience. But I had never been on a stage, where it's dead silent, everyone is staring at you, I don't have anything memorized, and no one interacts back with you. I somehow manage to walk out, begin my story, and then all of a sudden my microphone fell off of my ear. Next thing I know, the Tedx sound people ran on stage to help me fix it. (They cut it out of the video uploaded) but the audience was SOOO nice omfg. They were clapping and laughing with me. I was telling jokes. They fixed it and then when they walked away, my mic fell off my ear AGAIN and so I'm like WAITTT COME BACK and extend my arm to them to come help. Then I tried to pick back up on my speech and got totally sidetracked by it so at one point I literally just put my hand on my hip and in my head I'm like I'm just about to tell all these people I forgot what I was saying lmao. I look back now and I'm super proud of myself for pushing through all of it. There are so many details I left out of my story. More struggling, not being able to pay my bills, almost being evicted from my NY apartment, getting fired from ANOTHER job because I was pursuing my own path, being in a physically abusive relationship during the beginning parts of my career. I mean, the list can go on and on. Looking back, I can't tell you how I was able to come out of all of that. I kept going back to when I was that 3-4 year old girl in the store who wouldn't give up on herself when it came to tying a clear plastic bag you put fruit in. I had everything I needed inside of me to accomplish anything I wanted to or be anything I wanted to be. That's what I wanted to get across in this Ted Talk even if my story was all over the place. I had gone through everything I had gone through. Being denied from a huge fashion school and then still pushing through to create my own clothing line, even if it took me 6 years. Paving my own way for my life. Focusing on the positive vs the negative. Choosing to adapt to my new circumstances every time something didn't go as I planned. Realizing the Universe was trying to show me signs and being able to acknowledge. Knowing when it's time for a change, even if that means I have to come out of my comfort zone and be uncomfortable. As a kid I had a good stubbornness. I wouldn't give up on myself. No one could tell me anything. I wanted to prove people, including myself wrong. I never settled. THIS WAS A 4 YEAR OLD. I sat in the middle of that grocery store not caring if people were staring at me because I was determined to tie that bag. Guess what, I didn't give up and I completed it. I apply it to my life now. We all have in us already what we need and I think society, the media, life, bad experiences, just anything can happen where we doubt ourselves and give up or feel like giving up. All you need is YOURSELF and your THOUGHTS to change your outlook. WE all have inside of us what it takes to reach our full potential and I hope that my story, even though it was all over the place, could help you reach yours. Also, me clapping for myself at the end, I'm clearly my own cheerleader.